Called Mr. Thomas, this online store has been created by Chennai based company 3Dots Online solutions. Though the site pitches itself as Home Improvement store, the products listed are more of professional Hardware tools and machines from top name brands. The store lists products that you will not ordinarily find on other online sites in India. Some of the products listed on Mr. Thomas include Power tools, Small/Heavy machines, drilling products, hardwares, Construction equipments & accessories etc.. In the US, online home improvement stores like home depot do extremely well due to their DIY culture. Mr. Thomas is going after the same segment of consumers in India who want to carry out various home improvement tasks by themselves rather than hiring professional to do the job. India till now did not have a DIY (Do-It-Yourself) culture, but it is slowly starting to take off and that is what Mr. Thomas is banking on. As far as the site itself goes, the products are categorized into carious categories and sub-categories and also has deal pages that lists down good offers. One of the things, I would have loved to see was more detailed description on the product pages as most of them list just 3 or 4 bullet pointed features of products. The product names may sound quite alien to many visitors of the site, which may be a put-off! Another important aspect that Mr. Thomas need to concentrate on is educating consumers to carry out various DIY home improvement tasks. They have a site which targets a niche is still in its infancy, and educating the masses will definitely increase their buyers. For example, they could run a tutorial on something like “how to carry out wooden floor fitting at home”. They could list the process, the tools and machines needed and link them to their product pages. 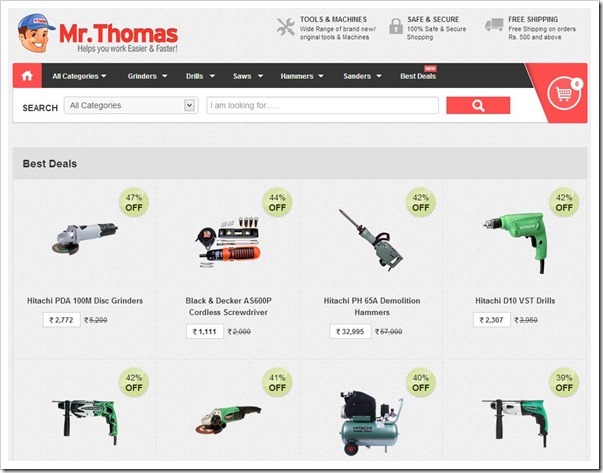 Overall, Mr. Thomas is a decent online hardware store for professional carpenters and plumbers, but for normal home consumers, they need to offer more information! Do try the site and let us know what you feel. I bought one item from the site. The delivery was prompt and the packaging good. I would recommend the site. It would be really helpful if they also stocked measuring instruments like squares, rulers, vernier callipers etc. Also hardware like nuts screws etc. Is there an online site in India which sells nuts, bolts, screws etc in retail or loose packs? I would be happy to know of such a site.